Running a small business has never been more challenging. The thing that's making it more complicated than ever is that the methods for generating leads for your small business don't work as well as they used to. It used to be as easy as buying an ad in your local newspaper, crafting a listing in your telephone book, or cold calling for new prospects. Consumers today, however, are more savvy than ever, and with the ease of internet and mobile search, they can learn anything they want about your business in a matter of minutes. Is your online image making the right statement? Do you know how your website is doing at converting visitors into leads? Are the graphics on your website non-existent, old and stale? Now more than ever, your online image is crucial to business success, and paying attention to your company website, your online presence and your social media profiles will determine your future success. As a business owner, it's important to have the right tools in your toolbox. We've taken a minute to highlight 5 great marketing resources that every business owner should be aware of to help improve the bottom line. For any company website, it is important that you know who your audience is and what they want in order for your marketing efforts to be successful. The best way to get to know your audience is through the traffic statistics to your website, which is what Google Analytics provide. Google Analytics is a free service offered by Google that generates detailed statistics and reports about the visitors to your website. It is the most widely used website statistics service, and for any business that is serious about using a website for online lead generation, it is a must have. Who visits your website: Including the user’s geographical location, which browser they used, their screen resolution, which language they speak, etc. What they do on your website: Including how long users stay on your website, what pages they are visiting the most, which page is causing the users to leave most often, how many pages an average user is viewing etc. Where they came from: You can see how a user found you. It can tell you whether it was through a search engine (Google, Bing, Yahoo, etc. ), social networks (Facebook, Twitter, Google +, LinkedIn), a referral (link) from another website, or a direct visit. 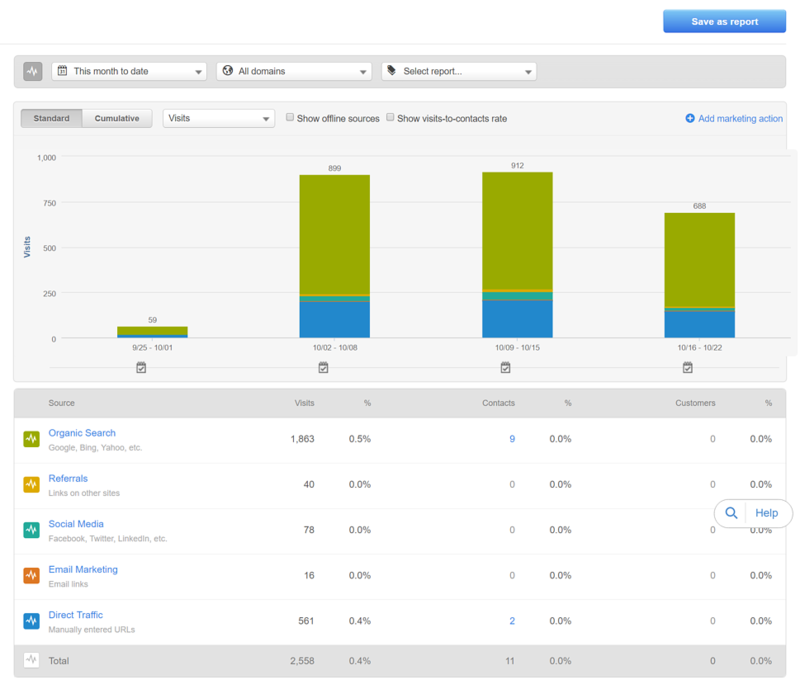 It also provides a breakdown of each traffic source, so you can focus on areas which drive the most traffic. When visitors come to your site: You can see which time of the day you have the most traffic on your site. This can help you pick times to publish your blog posts or new offers. How users interact with your site’s content: You can see how many users clicked on a specific link, which link drove users away, and your bounce rate. The extensive information provided by this tool allows a business owner to measure the impact of online marketing strategies and aids in better decision making. The 5 items listed here are just some of the basic statistics available. 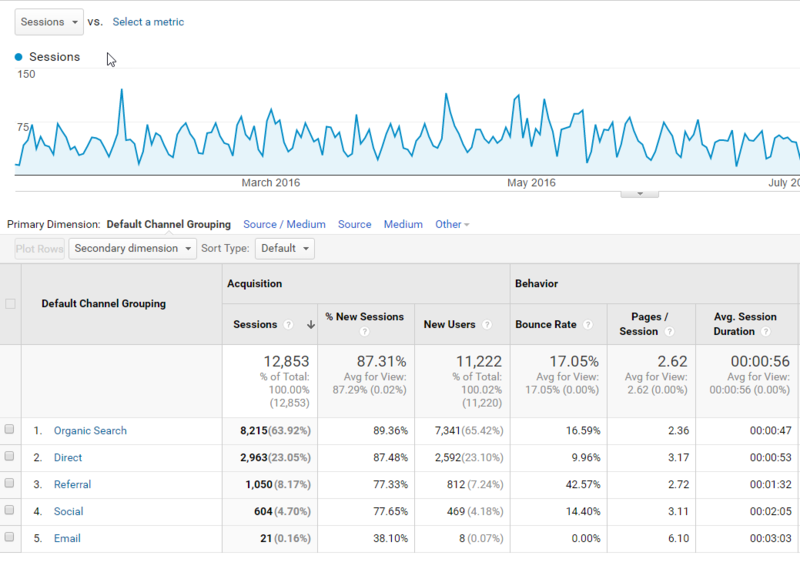 There are lots of other goodies in Google Analytics, if you take the time to find them. Open Site Explorer is a link analysis tool that allows you to explore all web pages indexed by search engines and get a huge amount of information about both your company website and that of your competitors. Open Site Explorer was developed and managed by SEO software firm SEOmoz in 2010. Its primary strength is to allow you to evaluate your own links and website strength. This is tremendously helpful when doing your own SEO, and analyzing your own strengths and weaknesses. One of the best features about Open Site Explorer is that you can run a competitive analysis against other websites. You can see how you stack up against the competition, and where there may be opportunities. Their comparison reports will let you know how each link profile (the quantity and quality of links) measures against each other. 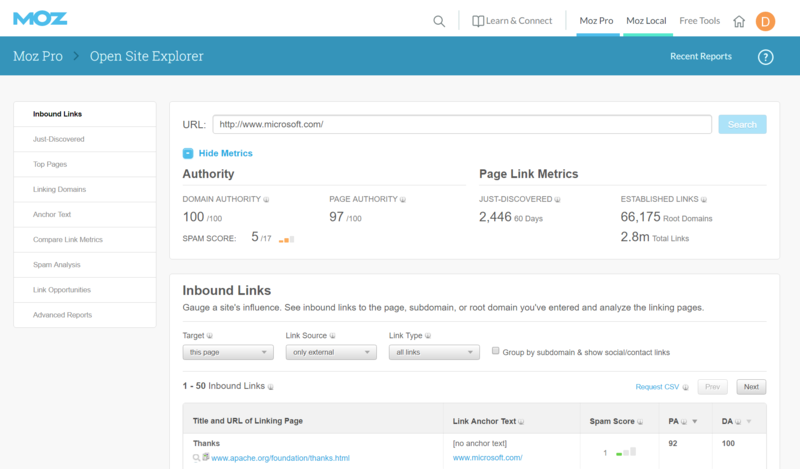 Page Authority: The quality score of your web pages (based on link metrics). Domain Authority: The quality score of your website (as a whole, based on link metrics). Linking Root Domains: The number of domains (separate websites) linking to you directly from their website. Total Links: The total quantity of links points to your website. Social Signals: This includes social media metrics that have a positive correlation with rankings. These include Facebook shares, Facebook Likes, and Google +1, etc. Open Site Explorer is a free tool provided on the Moz website, but a full version with more robust and detailed information is available with a subscription to Moz Pro. Business marketing is in the midst of a revolution. Over the past decade, inbound marketing has been trending upwards and replacing traditional marketing techniques, such as cold calls, ad buys, trade shows and purchased email lists, all of the things that we talked about at the beginning of this article. Inbound marketing focuses on creating quality and compelling online content, such as blog posts, eBooks, and case studies that pulls targeted traffic toward your website. By aligning the content that you publish with your customer’s interests, you naturally attract inbound traffic that you can then convert, close, and engage with over time. You can find out if your business should be doing inbound marketing by reviewing our article ...Is inbound marketing right for my business? The inbound marketing process can drive significant results for companies that make the commitment to the process, but it demands buy-in from company principals and a significant number of tools to implement it all. Record, measure and analyze behavior data from your website, including custom metrics created for your business. Design and build web pages, blog posts and offers quickly and easily. Send emails and drip campaigns after somebody buys from you or downloads something. Use that contact data to create personalized calls to action and website content to further the buyers journey and encourage sales. Finding the right set of tools for your business can be a challenge. The HubSpot software platform is the gold standard that makes all this possible. From attracting visitors, nurturing leads to closing customers, servicing clients and analyzing the data, HubSpot brings your entire marketing funnel together and allows companies to implement inbound marketing strategies from one comprehensive platform to make better marketing decisions. Human beings are distinctly visual creatures. What we see has an undeniable influence on how we interpret things either positively or negatively. Appealing images transcend language and words and allow for a greater understanding of whatever is being discussed. First impressions are formed within seconds, and since most of the information we consume and interpret is visual, quality design can make your site and your brand stick in a consumer’s mind as professional and credible. Make a bad first impression, and you may lose a customer forever. That’s just the way it is today. Infographics, blog and social media graphics and other visually appealing images can have a significant impact on how you are perceived by your customers. Most of us are not graphic design experts and this is where Canva comes into play. Helping to create simple images to engaging presentations, appealing social-media images and great looking infographics, this tool provides templates that are easy to use. On top of that, everything is stored online, meaning that you don’t lose your material. 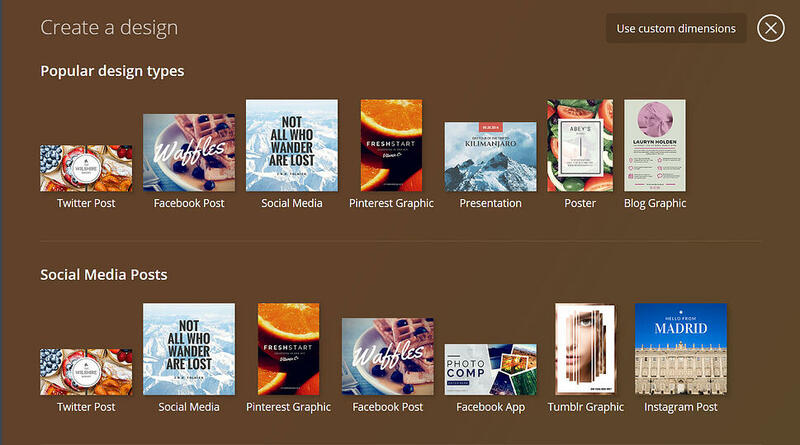 Canva is easy to use and has a significant collection of images that continues to grow. It’s perfect for small businesses that cannot afford to hire a graphic designer. Managing different social media feeds (Twitter, Facebook, LinkedIn, Google +, etc.) can be a full-time job. In fact, social media manager is one of the fastest growing careers today. For most small businesses, social media is growing in significant importance, but the thought of sitting at a computer or on your smart phone all day can be a mind-numbing and useless waste of time for most small business owners. This is where the Buffer App comes in. The Buffer App lets you schedule posts for the Big Four social networks, including Facebook (profiles and pages), Twitter, LinkedIn (profiles and pages) and Google+. It has also recently expanded to include both Pinterest and Instagram. The Buffer App gives you total control over your posting schedule without having to schedule every single post separately. Rather than requiring you to select and set a specific time for a post to go out every single time you want to schedule one, Buffer gives you a bunch of default time slots (optimized for the most active times on social media of the day) that your posts will be dropped into whenever you add them to your Buffer. 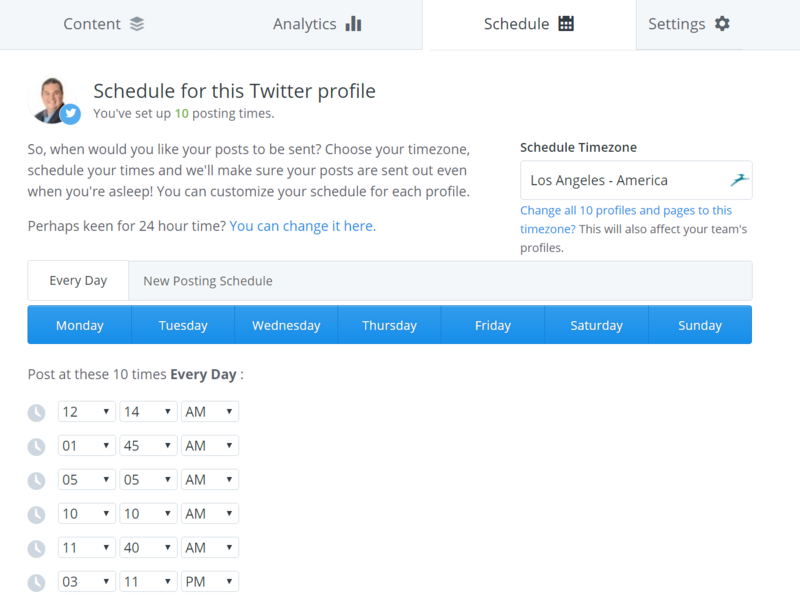 You can also add to and customize any of the time slots in your schedule you see fit. Buffer then sends your posts out automatically throughout the day or week according to the time slots you have set up for it. If you want more people in your network to see your updates but you don't have time to be on social media all day and every day, then using Buffer to schedule those updates is a clever solution. Best of all the app lets you see your engagement stats so you know what's working. Buffer has a free version that lets you manage 1 profile per social network, and a starter plan for $15 per month that lets you expand your social presence if needed. YouTube - Recent years have seen a big surge in demand for video content. If your business is not yet active on YouTube, you are missing out on reaching a huge audience of potential prospects on the second biggest website in the world. Help A Reporter Out - Even if you’re not a journalist you can use Help a Reporter Out to get publicity and advertising. Magazines, newspapers and websites are always looking to pull in some valuable publicity, so it gives you a chance to get quoted. SurveyMonkey - This is one of the most popular free marketing tools available. By collecting vital consumer data and information via SurveyMonkey, you’ll have greater knowledge about what’s working and what’s not working in your marketing efforts. Marketing your business has never been more challenging. Understanding how to market your company online is crucial for business success. Having the right tools can make a difference between merely surviving and thriving. If you feel like you need help with your marketing, check out our article, Why Should I Hire A Marketing Agency For My Small Business?